If you are looking for some SERIOUS chocolate in a cookie, this is a very safe bet. All of you milk chocolate lovers, just step away – this cookie is only for serious chocolate addicts. I proudly count myself in this group and thus thoroughly enjoyed this cookie. 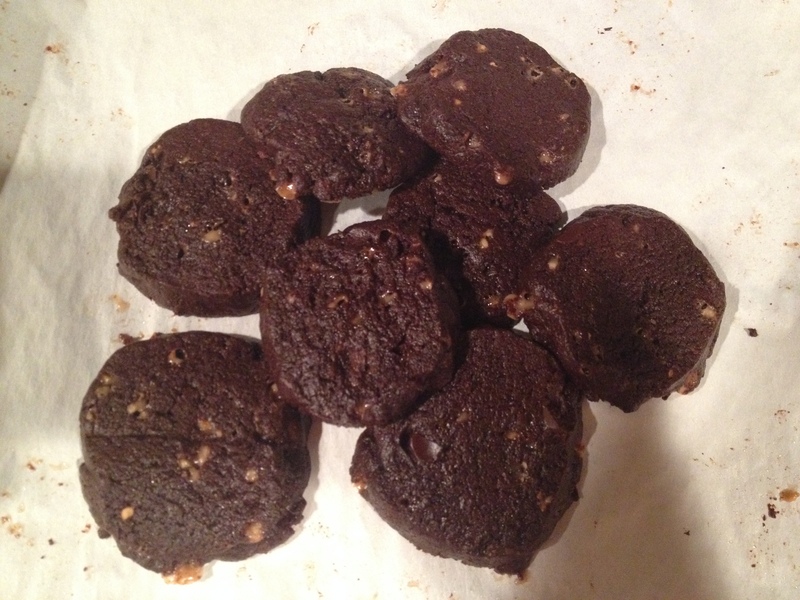 I actually used half unsweetened chocolate and half dark chocolate which made the cookie less sweet, but the chopped up toffee pieces are quite sweet so it definitely balances out nicely. You can of course use all normal dark chocolate if that’s what you prefer. The original recipe just seemed like it would make way too many cookies, so I’ve halved it here and it still makes a good 20 cookies or so. The dough is quite sticky so you can do this thing where you roll it into a log and then do a little slice and bake situation, which I shall detail below. I think this is one of those cookies that actually tastes better in baked cookie form than in dough form, which is nice, since it doesn’t result in me eating excessive amounts of raw cookie dough. 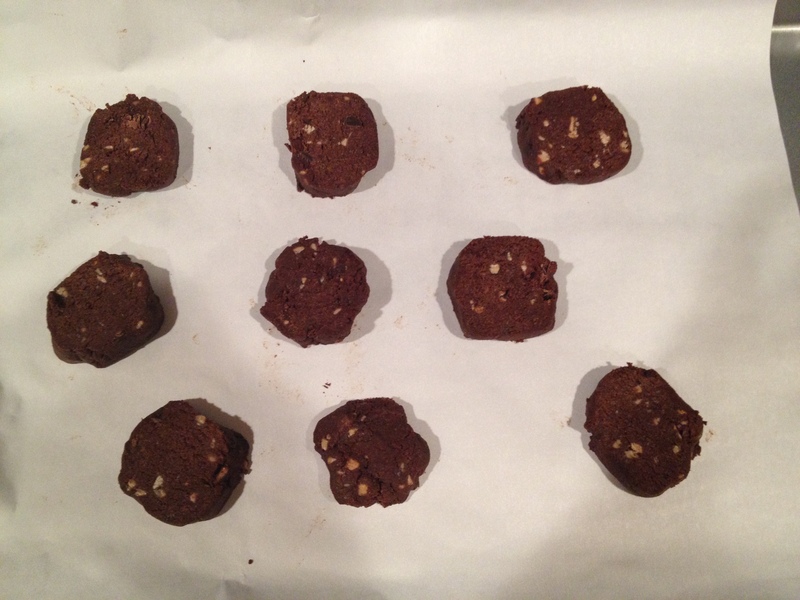 The cookies themselves are of course addictive, as I would never post a recipe on here that isn’t. This cookie almost comes together from more of a brownie perspective than the usual sugar and butter creaming perspective. 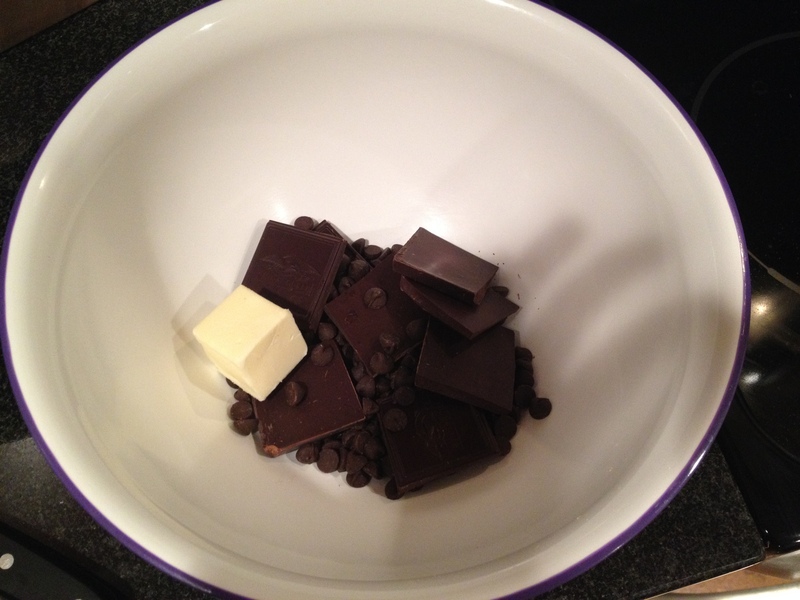 First, melt the butter and chocolate in the microwave in 30 second bursts, stirring to ensure it doesn’t burn. (You can do this in a double boiler of course, but I’m just lazy.) Let it cool to a lukewarm temperature for a few minutes. Then, mix in the sugar and the eggs, followed by the vanilla. Stir in the salt and baking powder, followed by the (admittedly very small amount of) flour. The dough will be quite sticky at this point – then stir in the chopped up toffee pieces and add just a bit more flour if it feels like it’s runny. But don’t worry about how sticky it is – just put it in the fridge to chill for about 45 minutes. Longer is fine as well. 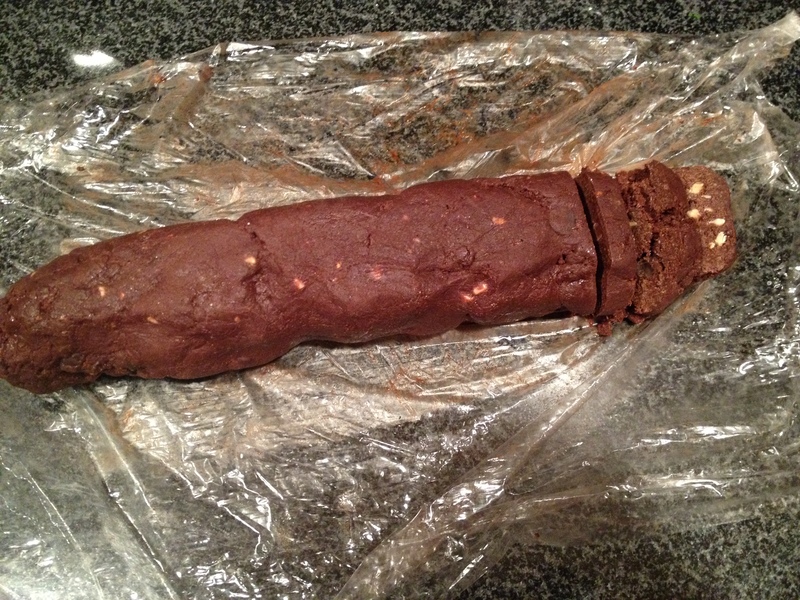 These cookies can be a bit of a struggle to scoop out into balls, so a nice approach to take to them is once the dough is chilled enough, dump it out onto saran wrap and shape it into a rough log shape (this really isn’t that hard). I wrapped it in the saran wrap and shaped it into the log that way by rolling it back and forth. Then put it back in the fridge – and it can be kept this way for a couple days, or in the freezer for up to a month and then just bake cookies off as you need. When you’re ready to bake, preheat the oven to 350 F / 180 C. You can either drop the batter by spoonfuls onto the sheets, or if you’re doing the log thing, cut it into small 1/2 inch (1 cm) slices. If you’re baking them straight from the freezer, they will probably need an extra minute or two. Bake until the tops are dry and cracked but cookies are still soft to the touch, about 12 to 15 minutes. Cool them on the sheets before eating – this is one of those scenarios where they actually do taste better after they’ve cooled for at least 10 minutes (I know it’s hard to wait). Enjoy your chocolate perfection. Butter and chocolate ready to melt. So much chocolate. Adding in the flour and the toffee pieces. 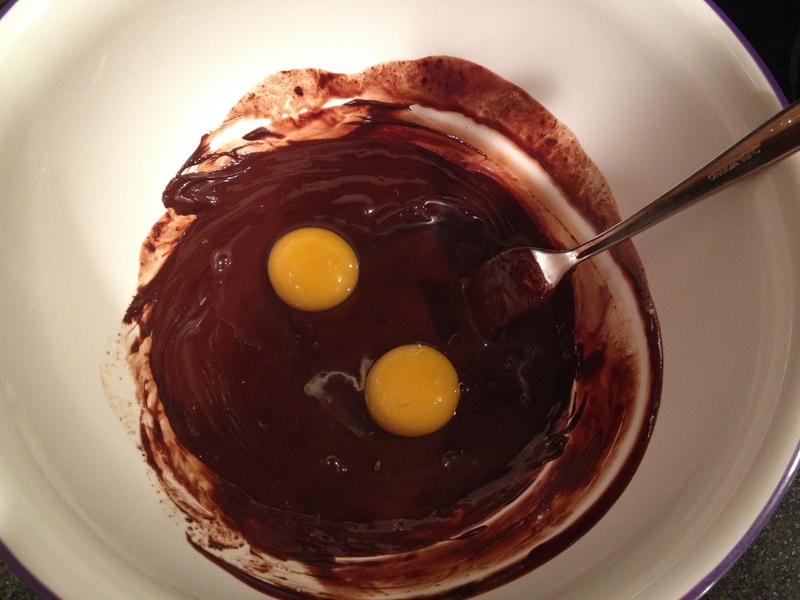 Oh and look at that, looks like I added in some chocolate chips too. 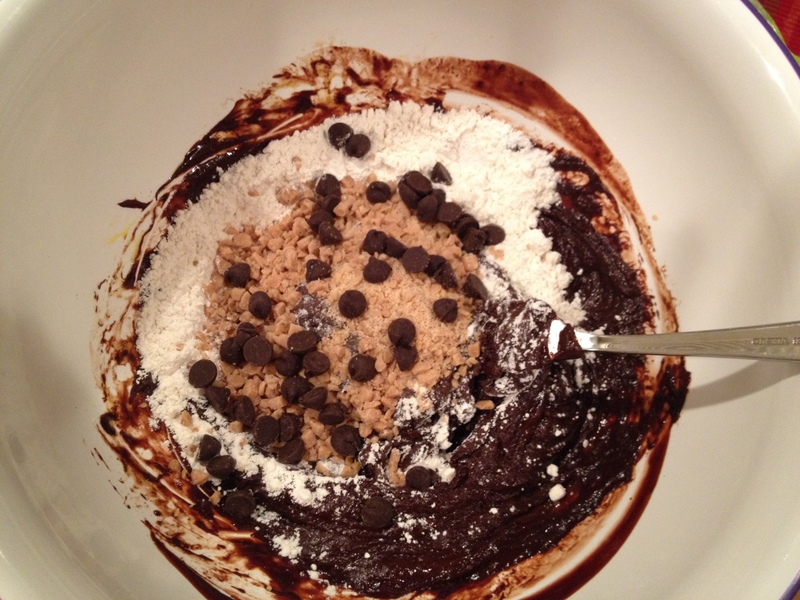 Because clearly there was not enough chocolate in the recipe already. And the delightful finished product! I mean, if you’re not convinced that these would be delicious by looking at the ingredient list, I’m not really sure what more I can do for you. I absolutely loved how dark these cookies were. They honestly weren’t that sweet despite the toffee bits because I had used unsweetened chocolate as part of the chocolate mix and not that much sugar. So it just felt like a dark but doable indulgence. This is a very grown up cookie. If you think you can handle it, please go bake it immediately.